After about two years of development and over 10,000 kilometres of testing, the wait is over: the Polo GTI R5 will make its competitive debut in the FIA World Rally Championship (WRC) at this weekend’s Rally Spain (25 to 28 October). The 200-kW (272-PS) Polo GTI R5 will be driven by the Norwegian duo of Petter Solberg/Veronica Engan (car number 49) and Frenchmen Eric Camilli/Benjamin Veillas (car number 47). The Volkswagen Motorsport team, which won a clean sweep of titles in the highest class of the World Rally Championship on four occasions between 2013 and 2016, will run the new customer car when it makes its only works outing in Spain. 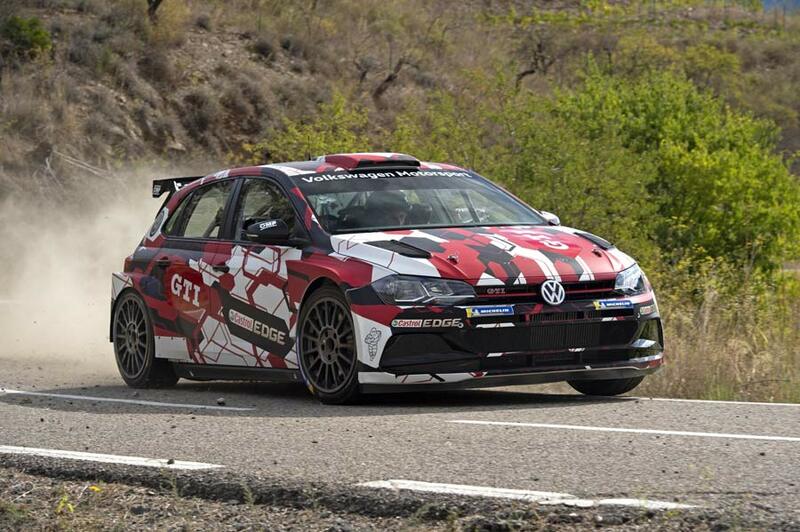 Solberg and Camilli will not be competing for overall victory in Spain, as the new Polo GTI was developed and prepared according to R5 regulations. Cars in this class have roughly 100 PS less than World Rally Cars. They are aimed at customer teams and privateers. Furthermore, their technology is based far more closely on production technology and is also significantly more affordable. In total, the Rally Spain comprises 18 special stages and a total distance of 331.58 kilometres. The combination of gravel and tarmac is unique within the world championship. “This is another reason why we selected the Rally Spain for the competitive debut of the Polo GTI R5,” explains Gerard-Jan de Jongh, technical project leader for the Polo GTI R5 and former race engineer for world rally champion Sébastien Ogier. Round twelve of the 2018 WRC season kicks off on Thursday with a spectacular special stage around the Montjuic area in the heart of Barcelona. The first full day on Friday takes in some very tough and dusty gravel routes, while the stages on Saturday and Sunday are held on winding and smooth tarmac roads in the mountains to the south of Salou. This represents a special challenge for the mechanics: at the end of the gravel day, they have just 75 minutes to convert the complete car from gravel to tarmac set-up at the evening service. “Among other things, we swap the chassis, brakes and gearbox,” says de Jongh, explaining the complicated challenge awaiting the mechanics. No pressure – but it could be the comeback of the motorsport year for 43-year-old Solberg, who has won 13 rallies during his time in the World Rally Championship. He then switched to Rallycross with his own team in 2013, since when he has twice been crowned world champion (2014 and 2015). Three titles in two different disciplines governed by the International Automobile Federation FIA is a unique achievement in the world of motorsport. Solberg’s PSRX Volkswagen Sweden team currently runs two Polo R Supercars in the World Rallycross Championship (WRX). This season, the team successfully defended the Team title it won in 2017. Solberg, one of seven test drivers, took the Polo GTI R5 out for the first time on ice and snow in Sweden at the start of the year. Back then, however, he was not planning a comeback. The second test came just last week in Spain, together with team-mate Eric Camilli. Like Solberg, Camilli is one of the test drivers who was heavily involved in the development of the Polo GTI R5 for Volkswagen Motorsport – as well as Raimund Baumschlager, Emil Lindholm, Dieter Depping, Pontus Tidemand and former world champion Marcus Grönholm. The 31-year-old Frenchman is also one of the most experienced drivers in the R5 class. In 2017 he finished second in the WRC 2 class at the end of the season. Since making his world championship debut in 2014, Camilli has competed in 37 WRC rallies.